This is so easy and so delicious! I made this for a family gathering and everyone raved about it. My brother thought he could make a better one so we did a blind taste test. This recipe won hands down, even my brother thought so! This is usually the first pie to disappear during a holiday get together. I followed the recipe exactly, no need to change a thing! Mix the cream cheese, confectioners' sugar and peanut butter together until smooth. Fold in 1/2 of the whipped topping. Spoon the mixture into the graham cracker crust. 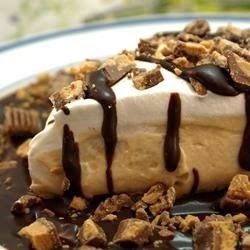 Place the remaining whipped topping over the top of the peanut butter mixture and garnish with the peanut butter cups. Chill for at least 2 hours or overnight before serving.